Remember when we wondered if Mastodon’s live show could help the visually impaired? Well, were still wondering about that. But now, we have some mighty visuals to explore, and some big questions to ask about the glorious therapeutic rumble of Mastodon live. 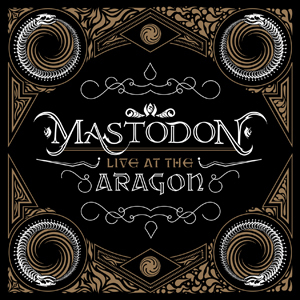 On March 15th Mastodon will release LIVE AT THE ARAGON DVD/CD a live concert package that captures the extremely fierce and mighty Atlanta metal band roaring their way through a set at the Aragon Ballroom in Chicago. The set will contain a CD and DVD recorded and filmed live October 19th, 2009, at the Aragon Ballroom in Chicago. It’s comprised of Crack The Skye performed live in its glorious entirety along with fan favorites from Blood Mountain (2006) and Leviathan (2004) plus a brutal cover of “The Bit” by Melvins. The DVD will also feature a 58 minute “tour film” that contains the films which were projected on screen, behind the band in performance. A special pre-order bundle includes the complete MASTODON: LIVE AT THE ARAGON, along with a Custom Mastodon guitar Pick Tin (with embossed picks) and a reproduction of the official Mastodon All Access Tour Laminate exclusive only to this package. If you’re new to Mastodon, I would suggest checking out their last album Crack the Skye(iTunes), and more specifically the album’s amazing lead song “Oblivion.” Like an epic metal track should, it courageously drills to the depths of human emotion, burrowing through sorrow, guilt and heartache and is inspired by the drummer Brann Dailor’s struggle with the suicide of his sister Skye. And what a powerful cathartic tribute it is, my friends. The Atlanta-based metal rockers weave together muscle and melody to create a sonic thrust that’s heavy and light, thunderous and tender. The swift six-minute mini-symphony is a beautifully epic threshold to an album that grows mightier with each passing note. With all the sonic mayhem and brutal punishing unleashed during a Mastodon live show, we have to ask…will the final impact on fans really help the visually impaired? And if so, will this new live DVD reveal to fans the band’s multi-sensory magic and power? And on top of the visual experience, what is the overall impact of the therapeutic thunder that fans experience during the show? I’ve always wondered why metal fans love the punishing feeling of bass, drums and guitar roaring at us and through us from the speakers. Do we feel a deep sense of pleasure in our bodies that makes the musical experience that much more intoxicating and addictive? Is a Mastodon concert experience profoundly heightened by sheer force of physical shock and awe felt as our entire body and every last inch of our organs glorious rumble in the midst of the sonic assault? Is that exhilarating feeling of sensual ecstasy worth dying for? And when it comes to evidence, rest assured, that as soon as we get a copy of Live at Aragon, will be sure to let you know just how awesome it is. What say you mighty Mastodon fan? Album out on June 7th! Cathartic indeed! Some might disagree, but as they say, different strokes for different folks. Being in the music industry, providing guitar picks for passionate musicians, it sure is great to witness various talents perform different genres. Thumbs up!